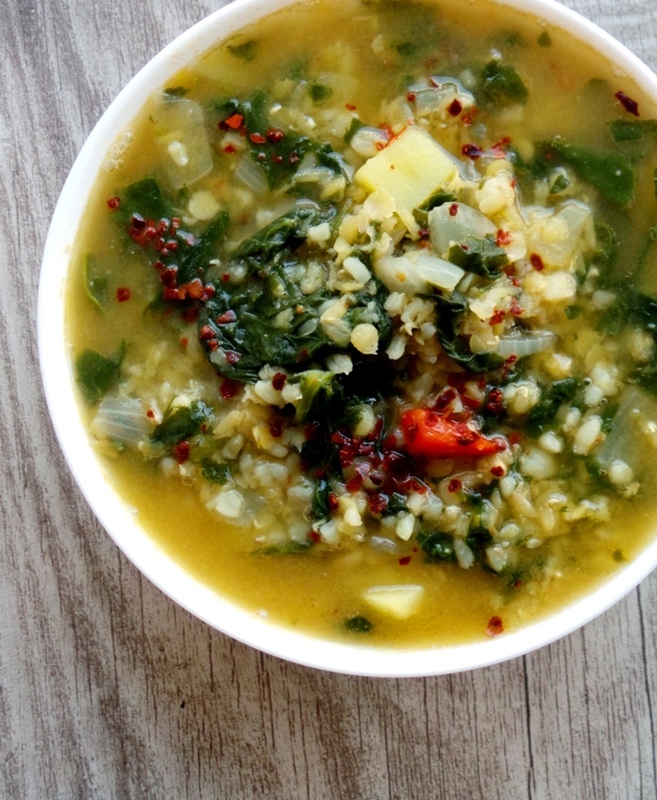 Say hello to this delicious filling bulgur, lentil and spinach soup and stay warm and healthy in this scary weather. If there is one healthy food I love just as much as pizza it’s gotta be soup. It’s warming, and if you manage to not burn your tongue at the first slurp – you’ll know it’s one of the tastiest things ever. Luckily for me, my dad makes the best soups in the world. He’d make nettle soup with rice, fish soup with tomatoes and garlic and those were all delicious (still are), but my favorite soup as a child was definitely chicken soup. In fact it still kinda is, but now that I’m trying to live healthier and eat more plants than animals, I had to come up with a vegan soup that’s just as good as chicken soup. So nothing tomato based and nothing blended. Nothing with curry, but also nothing bland. A soup that’s comforting and flavorful, but not overwhelming. It was not easy, but I made it. 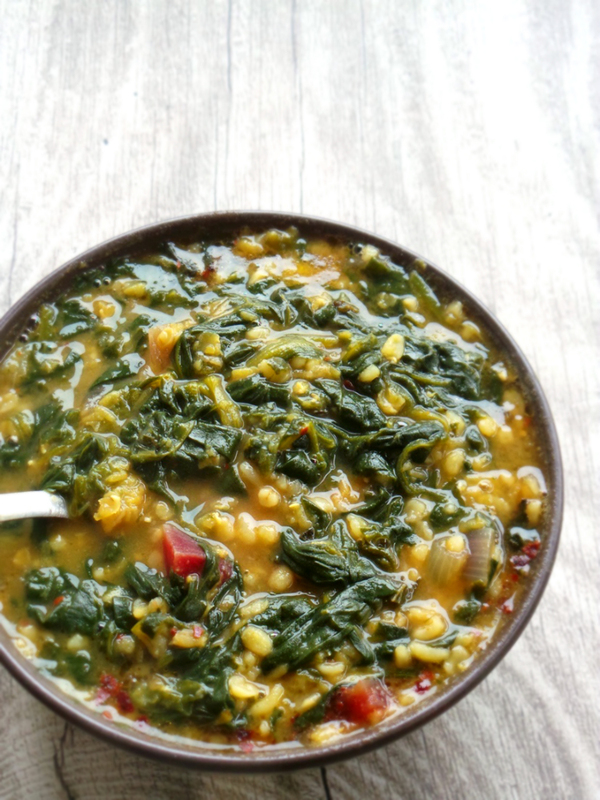 Now this lentil, bulgur and spinach soup has won me over and I’ve already made it 4 times (that’s in 2 months, which is a lot for me). It’s a mix between the nettle and chicken soup my dad makes, minus the nettle and chicken. Plus the spinach and lentils. I made some variations every time. You might notice that in some pictures the soup looks darker than others. That’s all beet’s fault. I had 2 beets sitting in my fridge for weeks (I’m lying, it was months), so I put them in there. If you don’t like beet that much (like I used to), but you’re impressed with how good for you they are – you might want to start adding some to your dishes. In a while your taste buds will adapt to that earthy taste that reminds you of eating dirt right now (wait for it…). Then you’ll be able to eat them more often and enjoying their beautiful color without feeling totally miserable. You’ll get some onions, garlic and spices, take a small cooking pot and sauté them in there for 2 min. Then you’ll add some water and the actual ingredients – red lentils (that you’ve soaked a while to absorb their precious nutrients better), bulgur, potatoes (or beet) and the spinach. After that you’ll add the water (if you want to use stock – do it, I didn’t) and some herbs and let that whole thing cook about 25 min. And then BAM – warm and delicious dinner is done. Nothing better than quick and healthy meals that warm your heart, your body and beat up influenza. It doesn’t get more nutritious than this, you guys. 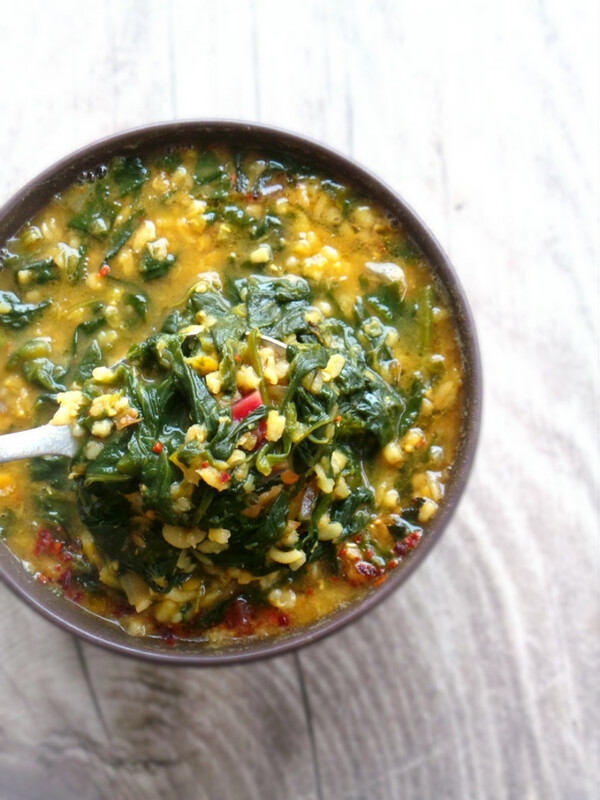 This soup is high-iron, high-protein, high-fiber, rich in magnesium and folate and filled with antioxidants and anti-inflammatory herbs and spices. 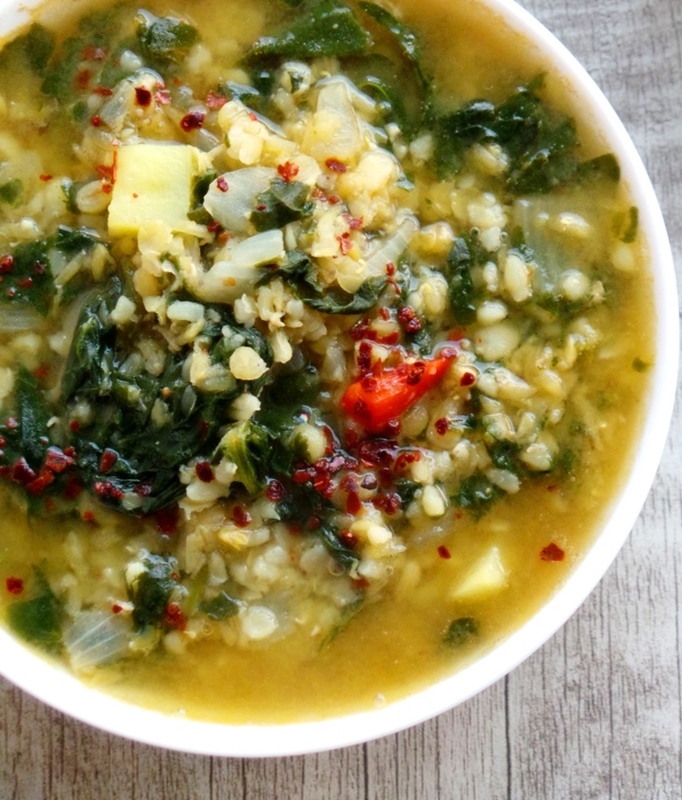 Now you’d think – WTF, how is a soup filled with antioxidants? Don’t the antioxidants die when we cook them? There are different kinds of antioxidant foods. Some have more bioavailable antioxidants when they’re fresh, others when they’re cooked. That’s the case with spinach. By cooking this green thing we break down its cell walls and finally set free lutein and beta carotene, so we can actually absorb them. These two are awesome phytochemicals that protect us from all kinds of disease and the skin from damage. Since it’s winter and freezing right now I used frozen spinach – no way you can find fresh organic spinach during winter. Well it might be organic, but it would have about 1/2 nutrient. So if it’s cold where you live as well – get the frozen thing! It’s got more nutrients and is much cheaper (like about 5 times). If you don’t like mint that much – add less or leave it out. I love it and in my opinion it makes soups a lot better, but that’s just a personal preference. I used coarse bulgur here – it has a similar texture to rice, but cooks quicker and is more nutritious. However bulgur or bulgar, or whatever you guys call it – is not gluten-free. 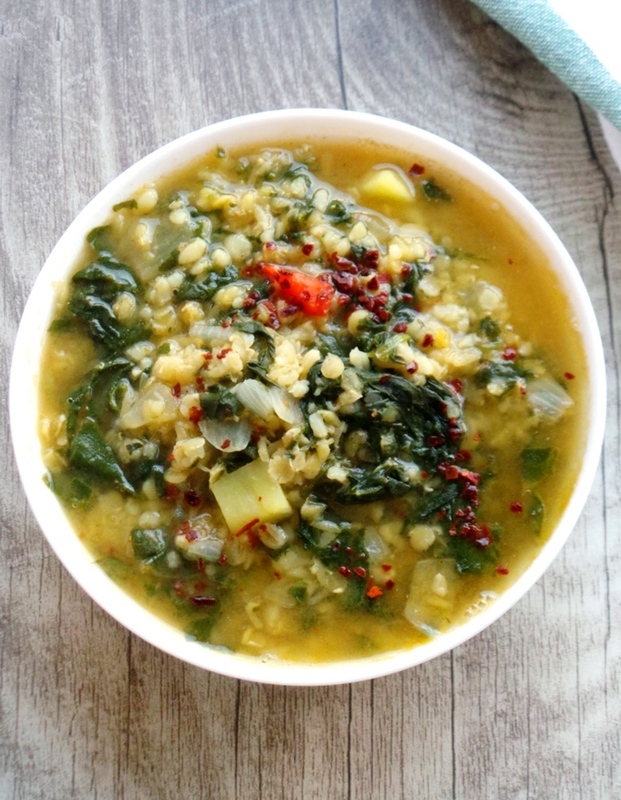 If you want to make this soup gluten-free use either rice (cooking time will vary depending on the kind), quinoa or millet. Quinoa and millet are more nutritious than rice, but are smaller and the texture will be a little different. A tasty, filling and satisfying vegan soup to keep you warm and healthy during winter. Preparations: Rinse and drain bulgur and lentils. Peel & chop potato/ beets. Chop onion, mince garlic and measure your spices (you can mix them in a bowl for more convenience, but even if you add them one at a time - it would be fine). Mint - remove stalks, keep leaves and wash well. You can also use dry mint. A handful of fresh ones or just a few pinches of dried mint leaves - just rub them between your fingers. If you use frozen spinach - defrost it, if fresh - WASH it. Cooking: In a medium pot, cook the chopped onion and minced garlic with 1 tbsp olive oil for one minute at medium high. Then add the spices and mix well together. Add a few tbsp water - spices might get a little smokey and burn-y if there's no fluid. Then add lentils, spinach, bulgur, pepper and potatoes. Add mint and 2,5 cups of water (or stock) to cover everything. Cover with lid and cook for 25-30 min. You'll probably need to add some more water during cooking, so make sure to check how things are going during cooking. When bulgur, lentils and potatoes are cooked - turn off heat and add 1 tbsp olive oil. Ready! Serve and eat right away. This soup will keep in the fridge for at least 3 days. Bulgur might soak up the fluid, so make sure to add some water if you eat this soup a few days after you've made it. 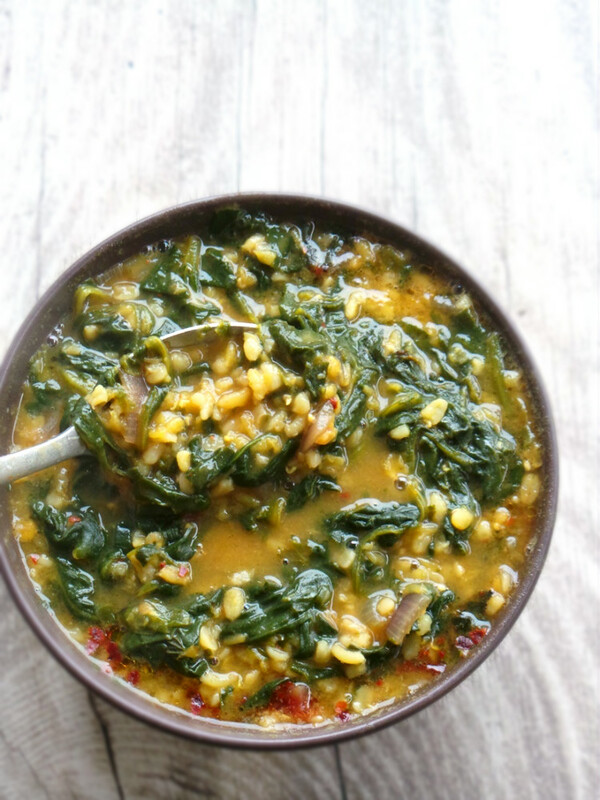 Hope you enjoy this recipe, but know it’s not over yet…I made some more recipes with red lentils, bulgur and spinach and I’m posting them all this week, so if you buy the ingredients for this soup, there will be two more delicious dinners you can make with them here. Have a nice week and see you! This recipe was featured on CountryLiving.com in a roundup with 47 other delicious healthy soup recipes, which I am super excited about. You can find the article and the other 47 recipes here. Simple bulgur and spinach dinner. I love this. I used a whole bag of shredded carrots and no potatoes. And I didn’t have fresh mint. It’s still really good just with the basic spices and made with chicken broth. It ended up not being soup–more of a grain dish, which was perfect. Thanks! Thanks for your feedback, Marcia 🙂 Very happy you enjoyed the recipe! Your recipe calls for red pepper but the instructions forgot to include it. haha, oops, thanks for letting me know! I updated the recipe! It’s one garlic clove and add the pepper with the spinach & potatoes.